My memory says, my Mom told me so. ie ‘the hard way’ …And, I would imagine my grown adult children might remember the same words. Lewis’ quote seems to awaken in me how many times I read wise counsel from God’s Word only to defile them. Surely, the hard way set in and the brutal teacher appeared. Is it possible to skip grades by following directives from the holy writ? CS Lewis’s quote and Tammy’s ‘familiar words’ sure make you realize that real learning doesn’t seem to come from the simple osmosis of listening or reading something. One definition of brutal I found was: “punishingly hard or uncomfortable”. 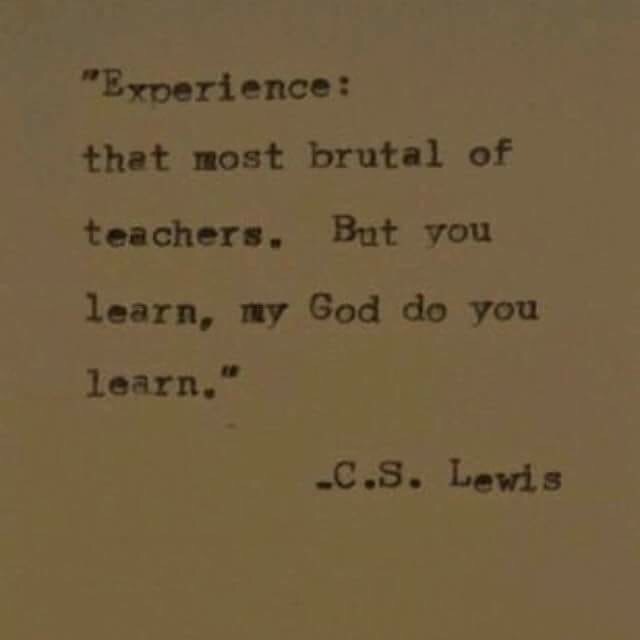 For me, makes the word ‘experience’ take on a whole new depth of meaning. Debi, on your new meaning of ‘experience’ does it change your teaching high school students? If so, be nice to hear how things might be different? Sara, if I understand your question correctly, I would say yes…at least it should change how I teach high school students. One example I can think of involves one of the agriculture classes I teach. We recently completed a chapter and a written test about woody plants (trees/shrubs) that involved written and oral information about these types of plants …their identification, cultural requirements and planting guidelines. The next day we had to go to a job site and do some replanting and planting of large shrubs. On attempt to remove and replant the first extremely heavy boxwood, no one could recall exactly all the info they had just listened to and/or read and been ‘tested’ on regarding correct planting. But after approx 3 hours (and 7 large shrubs later)of struggling in the heavy wet clay with shovels, rakes, tape measures, levels, etc, they could definitely tell and demonstrate how to correctly plant. Though tired and dirty, the lesson had been learned. Oh, no do you think those students will made an effort to pay attention and learn in class before the digs? Yes, I think so, but it seems that for many, some type of ‘experience’ does help them understand and retain the concepts.